Order or Get a Quote! Need to identify a part? 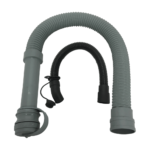 We sell replacement parts for just about every brand and model of Floor Scrubber, Sweeper, Street Sweeper, Jet/Vac Combination Sewer Cleaner, Water Jetter, and Hydro Excavator. 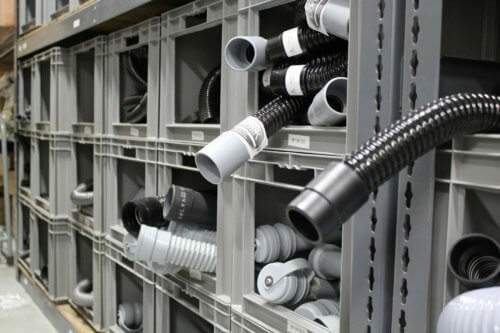 Our parts inventory is stocked with the most common wearable parts for industrial, commercial, and municipal cleaning equipment, and we can also provide more unique parts for repairs as needed. We sell both OEM and quality aftermarket parts. We have over 50 years of cleaning industry experience! Our service technicians are factory-trained and specialize in scrubbers, sweepers, and street sweepers. We know these machines inside and out, and are happy to share our knowledge with you to get you exactly what you need. We also do repairs and maintenance. For best cleaning performance, and to avoid damage to your machine, be sure to maintain and replace wearable parts as recommended by your machine’s manufacturer. We recommend keeping your own stock of the most common parts on hand, to minimize potential downtime. Consult your machine’s user manual to learn about how to best care for your scrubber or sweeper, and to identify part numbers. For sweepers in particular, we highly recommend investing in a quality air filter, especially in dust-heavy facilities. Whether OEM or aftermarket, just make sure you get a good one. Filters are in place to prevent dirt that is collected from the ground to access the motor. Therefore, a blocked filter could affect airflow or eventually wear out, which could damage the motor of your cleaner. Filters can and should be cleaned after each use, and you should replace them when they become brittle or old. Check the packaging of your filters for more information — each filter has its own recommendations for usage. Some filters can be rinsed with water, and others are not replaceable. One of the most important floor scrubber parts is a squeegee blade. These rubber blades attach to the machine and are used to wipe liquid from flat, smooth surfaces. When used in combination with a pressure pump, squeegee blades release grime from the floor and wipe it away to create a clean, new surface. If your floor scrubbing machine is starting to leave lines of dirt or liquid behind after use, it could be a sign that a squeegee blade is beginning to wear down (or that it needs to be adjusted). If the squeegee has holes, tears, or cracks, or seems brittle, it should be replaced. New blades should be the same size as the blades being replaced. The user manual of your machine should describe the replacement process in detail. Your scrubber brushes and sweeper brooms do a lot of the hard, physical work of cleaning, which means that they also tend to wear out over time. 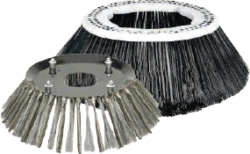 You can get more life out of your sweeper broom by periodically rotating and adjusting it, but eventually you’ll need a replacement. 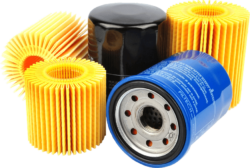 As it pertains to floor scrubber parts, vacuum parts or any other cleaner’s parts, batteries top the list as far as both potential problems and overall importance are concerned. 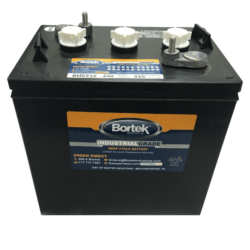 Just like a car battery, if a floor cleaner’s battery no longer runs adequately, cleaning will not be efficient.If you have trouble turning your floor cleaner on or you think your cleaner sounds different, it’s a good idea to check on the battery. Consider charging batteries every 10-14 days based on regular use and to get the most out of them. Do this regularly and replace as needed to ensure the highest level of efficiency for your machine. When vacuums, floor scrubbers, extractors and other pieces of cleaning equipment operate, they generate heat. 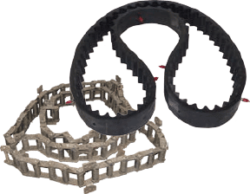 The heat from regular use causes rubber belts inside of the machines – belts that allow for smooth operations – to stretch and slip. Because these belts are responsible for spinning brushes and other cleaning mechanisms, a machine with an old belt won’t function as effectively as one with belts that are changed regularly. Belts are critical and should be checked regularly. You can replace them every 6 months to one year, depending on use. Attachments and accessories can get lost or damaged due to their external or detachable nature. When any of the variety of parts tailored for your specific cleaning application wear out or go missing, let us help you find a replacement. Contact us today! We’re ready to answer your questions, and we’re happy to assist in the maintenance, parts, and buying processes.